Stereotactic radiosurgery (SRS), introduced in 1951 by Swedish neurosurgeon, Lars Leksell, MD, continues to advance the treatment of brain metastases. Historically, SRS has been performed in a single session using the Leksell Gamma Knife (Elekta, Stockholm, Sweden), developed by Dr. Leksell in 1968.1 However, as linear accelerator technology progressed with sophisticated beam-shaping technology, advanced treatment planning systems and image-guidance tools, new linac-based SRS solutions entered the market, including the CyberKnife (Accuray, Sunnyvale, California), Novalis Radiosurgery (Brainlab, Munich, Germany) and the Edge (Varian Medical Systems, Palo Alto, California). “SRS has revolutionized the management of brain metastases, and more or less replaced whole-brain radiation therapy (WBRT) for patients who have limited disease,” says Gene H. Barnett, MD, MBA, a neurosurgeon and director of Cleveland Clinic’s Brain Tumor and Neuro-Oncology Center, Cleveland, Ohio. Dr. Barnett is also vice chairman of the Department of Neurological Surgery, and director of the Cleveland Clinic Health System Gamma Knife Center. “Now that we can treat the individual spots that we see in the brain, we can spare exposing much of [a patient’s] normal brain tissue to radiation,” adds Lawrence Richard Kleinberg, MD, associate professor of Radiation Oncology and Molecular Radiation Sciences at Johns Hopkins Medicine, Baltimore, Maryland. Dr. Kleinberg uses the Cyberknife system (Figure 1). In general, two types of SRS systems are available: a dedicated, frame-based system such as the Gamma Knife, and linac-based systems such as the CyberKnife, Novalis and Edge. 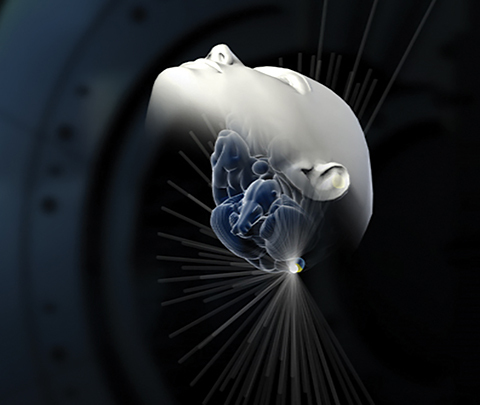 The Gamma Knife involves a high-dose, single-fraction treatment while the linac-based solutions typically involve multiple fractions at lower doses. “More recently, there has been enthusiasm for multisession treatments,” says Samuel T. Chao, MD, a radiation oncologist at the Cleveland Clinic and associate professor at the Cleveland Clinic Lerner College of Medicine at Case Western Reserve University, Cleveland, Ohio. The Minniti study also found that the most significant difference in local control was for lesions > 3 cm, with single-fraction SRS treatment having a local control of 54% at 1 year vs. 73% with multifraction SRS.2 Dr. Barnett and colleagues have been using single-fraction SRS on patients with larger-sized brain metastases who traditionally would not have achieved the desired local control with a staged treatment. In these cases, the patient would return in a month for another treatment to achieve the necessary therapeutic dose, thus reducing the need for surgery, he says. While surgery has an important role in treating brain metastases, the focus has shifted to the timing of SRS in conjunction with surgery to further maximize control, adds Dr. Chao. The recurrence rate is 50% with surgery alone compared to > 70 % with surgery followed by SRS, he says. Ideal WBRT candidates include patients with leptomeningeal disease in which the tumor cells spread to the membranes surrounding the spinal cord and brain, and those with multiple radiosensitive lesions, says Dr. Barnett. Modern linacs capable of volumetric-modulated arc therapy (VMAT)/intensity-modulated radiation therapy (IMRT) or tomotherapy can help avoid the hippocampi, which may lessen the risk of cognitive side effects, adds Dr. Soltys. Brown et al studied the effects on cognitive function in patients with 1 to 3 metastases who either received treatment using SRS alone or SRS in conjunction with WBRT. In the 213 randomized participants, the study found less cognitive deterioration at 3 months with SRS alone compared to when SRS was used with WBRT.6 Based on this study and others, the American Society for Radiation Oncology (ASTRO) issued recommendations in 2014, which were updated in 2016, that oncologists should not routinely add adjuvant WBRT to SRS in patients with limited brain metastases, with good performance status and brain metastases from solid tumors. The Yamamoto study was the first clinical trial to prospectively omit WBRT in patients with up to 10 brain metastases.7 “When comparing 2 to 4 or 5 to 10 brain metastases, Yamamoto et al found there was no detriment to survival when using SRS rather than WBRT,” says Dr. Chao. Now, he and Cleveland Clinic colleagues still consider SRS for patients with up to 8 or even more brain metastases, and consider delivering hypofractionated or multiple session SRS treatments more frequently. With SRS, patients also can continue chemotherapy during treatments. Dr. Kleinberg explains that a combined toxicity occurs when using WBRT and chemotherapy. Blood circulates through the brain and, after WBRT, blood counts and immune cells both drop; chemotherapy has the same effect. Although not commercially available, systemic therapies involving targeted agents and immunotherapy are also being investigated for their therapeutic role with SRS. “Now with a better understanding of biomarkers and genetics, we need to think about the variety of ways we can manage a patient with brain metastases—how we can utilize that systemic therapy to improve the ability to control disease in the brain,” says Dr. Chao. Dr. Kleinberg says that some investigations of MR spectroscopy and MR protein transfer, as well as other potential imaging techniques involving fluorothymidine F 18 (FLT) PET, may help distinguish these conditions in the future. In addition to continued development of sequences and tracers, a blood biomarker could help distinguish between necrosis, swelling, and tumor regrowth, says Dr. Soltys. Chen JCT, Girvigian, MR. Stereotactic radiosurgery: instrumentation and theoretical aspects—part 1. Perm J. 2005;9(4)23-26. Minniti G, Scaringi C, Paolini S, et al. Single-fraction versus multifraction (3 x 9 Gy) stereotactic radiosurgery for large (>2 cm) brain metastases: a comparative analysis of local control and risk of radiation-induced brain necrosis. Int J Radiat Oncol Biol Phys. 2016;95(4):1142-1148. Bhatnagar AK, Flickinger JC, Kondziolka D, et al. Stereotactic radiosurgery for four or more intracranial metastases. Int J Radiat Oncol Biol Phys. 2006;64:898-903. Likhacheva A, Pinnix CC, Parikh NR, et al. Predictors of survival in contemporary practice after initial radiosurgery for brain metastases. Int J Radiat Oncol Biol Phys. 2013;85:656-661. Baschnagel AM, Meyer KD, Chen PY, et al. Tumor volume as a predictor of survival and local control in patients with brain metastases treated with gamma knife surgery. J Neurosurg. 2013;119:1139-1144. Brown PD, Jaeckle K, Ballman KV, et al. Effect of radiosurgery alone vs radiosurgery with whole brain radiation therapy on cognitive function in patients with 1 to 3 brain metastases a randomized clinical trial. JAMA. 2016;316(4):401-409. Yamamoto M, Serizawa T, Shuto T, et al. Stereotactic radiosurgery for patients with multiple brain metastases (JLGK0901): a multi-institutional prospective observational study. Lancet Oncol. 2014;15(4):387-95. Mulvenna P, Nankivell M, Barton R, et al. Dexamethasone and supportive care with or without whole brain radiotherapy in treating patients with non-small cell lung cancer with brain metastases unsuitable for resection or stereotactic radiotherapy (QUARTZ): results from a phase 3, non-inferiority, randomised trial. Lancet. 2016;388:2004-14. Massat MB. 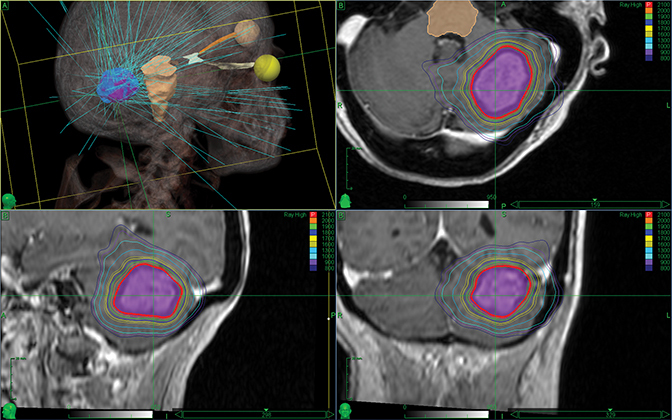 The expanding role of stereotactic radiosurgery in the treatment of brain metastases. Appl Rad Oncol. 2017;6(1):24-26.